One of the main things everyone who is expecting a new baby anticipates is the crying. Babies cry - we all know that - it's the only thing they have to allow them to communicate with us. I remember (all be it vaguely) my son being a bit (a lot!) of a crier when he was tiny - he suffered very badly with colic and looking back, apart from those bottles of Infacol, we didn't have anything to help us through it at all, we simply just got on with things. But if there are things out there to help, why not use them to make life that little bit easier? I know I wouldn't say no, but all those years ago I don't remember there being anything around. I mean I knew that "shushing" my son continuously and being in the kitchen with the dryer on whilst he was screaming helped a lot but I thought I'd just fallen lucky discovering something he liked. As it turns out, white noise is now very well known for it's ability to calm babies - the continuous, repetitive noises seem to help to relax and settle them. Naturally, after ten years of being without a crying baby I was very happy to welcome this little gem of knowledge. Don't get me wrong, the thought of Baby Baker crying wasn't an issue at all but Baby Baker having full on diva strops which I could do nothing about totally bloody terrified me. So when I was sent a nifty little device to have a peek at from The Gro Company to use once Baby Baker made her appearance I was very intrigued. The device - the Gro Hush Baby Calmer - is a small hand held device which emits very low levels (75 decibels) of white noise directly into babies ear in an attempt to calm and soothe them. 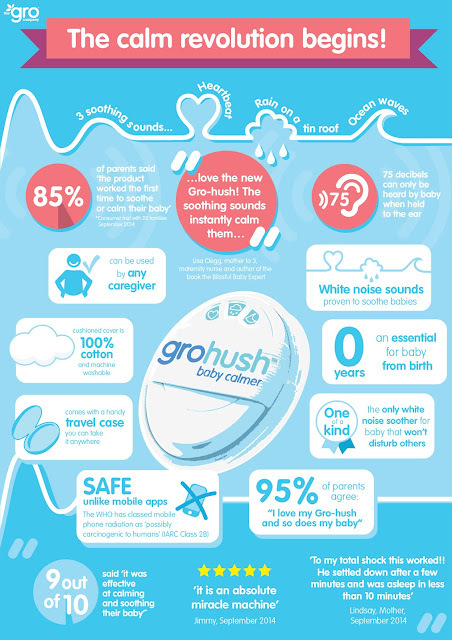 The Gro Hush is really safe - the sound levels can not exceed the set 75 decibels, meaning that not only is it just baby hearing the sounds with no disruption to people close by, but, most importantly, it will not damage baby's delicate little ears by blasting out loud noises. I did actually (obviously!) test the sound level out on my self before I put it anywhere near Baby Baker - and true to word, the volume level is very low, audible, but low. I found the handy size of the Gro Hush and the fact that it has a sturdy, lightweight storage case brilliant as I was able to drop it into Baby Baker's bag, keeping it close at hand to use when I was out and about - which is without a doubt the time when those diva strops would cause me the most panic. Well, yes it did and very well too. I think we've been quite lucky so far, Baby Baker is a really good baby - she only cries to let us know she wants something and spends the majority of the time she is awake smiling and "talking" to us. But, naturally, especially when she was just a few weeks old, we had a fair few crying sessions - perfect for testing out the Gro Hush. I simply popped my hand through the elasticated hand strap and gently held the soft padded section to her ear whilst I was cuddling and reassuring her. Once Baby Baker realised it was there and had actually latched onto the sound her crying began to calm down almost immediately until it actually stopped altogether. I won't say it worked with every crying session I tested it on, but certainly it helped ease the situation in the majority of cases. I've even used the Gro Hush at bed time too and placed it close - but not too close - to Baby Baker's head whilst she was in her moses basket and beginning to stir. Although the sound was obviously fainter to her than if it was placed directly onto her ear, again, it did help to soothe and comfort her.